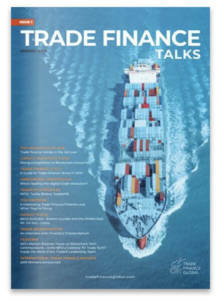 Deepesh Patel: Hello and welcome to Trade Finance Talks – a podcast from Trade Finance Global. My name’s Deepesh Patel, editor at TFG, and during this series, we’ll be hearing from global experts and learning about the latest trends, tech and insights in the world of international trade and receivables finance. 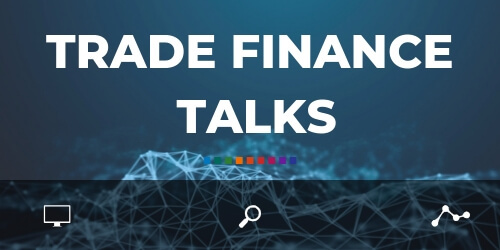 In this edition of Trade Finance Talks, we speak with Roberto Mancone, Chief Operating Officer at we.trade, and Daniele Gnagnarella, who is the Business Development Manager. Here, we discuss how they are changing the face of trade and receivables finance, and the Consortia 2019 event in May. Deepesh Patel: Thank you so much for joining me here today – it is great to have you on board. If you could begin by briefly summarising we.trade in terms of how the company is changing the face of trade and receivables finance that would be great. Roberto Mancone: Hi, my name is Roberto Mancone, I’m the Chief Operating Officer at we.trade. we.trade is an innovative platform owned by 12 European banks – it’s a trade platform allowing importers and exporters that work with banks to create user-friendly front-ends that create and record smart contracts. Subject to automatic verification of certain events, they can trigger conditional payments or requested financing or guarantee, which fulfils the completion of the trust among the parties involved. DP: What are your thoughts on distributed ledger technology (e.g. blockchain) as a disruptor to trade finance? 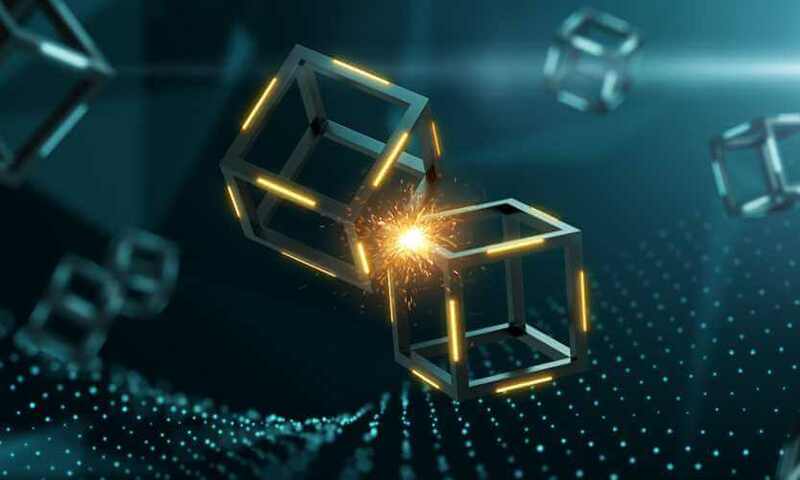 Daniele Gnagnarella: Well, linking up to what Roberto just said, obviously from our own perspective and from our personal perspective, blockchain is a game-changer and new technology that is just at the beginning of its journey. It is still advanced enough for us to leverage and use within existing processes. Blockchain certainly fits well within the trade finance industry because it’s an industry that hasn’t really been upgraded for a long time and it is very paper-based and very bespoke. What this new technology really offers is the possibility to digitise and completely change the business case and change the way parties transact with each other. This helps us create new business models for our banking partners and to their customers that they will bring on to our platform. Does blockchain really make a difference? DP: How is we.trade actually utilising blockchain technologies and how is this making a difference to others within the ecosystem? RM: First of all, we.trade is using the enterprise stack, Hyperledger fabric, as an underlying technology, and for blockchain we are using IBM. We went to a selection of technology providers and in May 2017, we took the decision to go with Hyperledger fabric because we wanted to have a platform that was able to create an ecosystem. In that regard, we didn’t want a technology that was more financially driven; we wanted something that could open up to lots of applications in the future, especially those developed by potential future stakeholders. We have since developed the platform, which is in production, together with IBM. We partnered with them because we wanted to build the platform in less than 18 months, and the model we use as a software service licence to the banks, which means we.trade is a legal entity that licenses the solution to them. They then make it available to their clients, so we obviously need to ensure we completely fulfil the banks’ regulatory requirements. IBM understand what these requirements are, which makes it more straightforward. DP: The decision to choose Hyperledger over Corda is a big one and we see the other big player in the ecosystem, Marco Polo, using Corda technology. What are your thoughts on the different blockchain consortiums, such as the TradeLens Marco Polo? How can they coexist as they converge on to a single platform? RM: I think in the last eighteen months we have seen tremendous development in the proof of concepts. There have been some real production environments that show transactions in under two hours. The benefits of the consortia, such as sharing investment and creating a common understanding, are balanced by the fact that there has to be an eventual winner, so some consortiums will no doubt fail. In our case, we.trade and Batavia were practically going head-to-head and, in the end, three banks of the Batavia consortium decided to join us instead, so I am sure there will be more consolidation in the future. I won’t talk about interoperability at the moment because I think that it is right – that there should be competition among platforms, and the development of alternative solutions. DG: I personally believe there is space for two or three platforms to coexist and you can already see there are some clusters forming around a few different technologies or platforms. I also think there will be an interoperability within the industry, but as Roberto said, this is really the phase of investing and we’re probably a couple of years away at the moment. DP: We’ve seen huge successes in many other industries around credit insurance and ICC uniform customs rules etc. Do you think there is the need for some form of standardisation or uniform rules? DG: I think standard deviation is slightly different than interoperability – it’s obviously a precursor to that in the fact there are already a few initial conversations within our groups potentially try and create some form of common standards. we.trade works with the ICC; we were in constant collaboration and if you look at the group of fans that own cargo free trade they are obviously some of the most experienced in this industry. However, you need to have enough substance on the platforms before you can start talking about building standards. That’s the direction that we.trade has been going in – we want to make sure that we have significant volumes on our platform first. DP: What do you think are the main challenges that need to be overcome in order to effectively enable blockchain utilisation and support its full adoption within the trade finance space? RM: As with any new technology or industry, the main challenges is the change management – the capability to convince any stakeholder how to leverage the potential of technology to leverage the potential of smart contracts. You need to define a new customer experience that satisfies the new business model instead of merely replicating existing operating models. SMEs do not have the capacity or strength to look at the resources they need to increase knowledge of this technology, so I guess that shifts the burden of responsibility to big companies. It is on big players like ourselves to create solutions that SMEs can enjoy without developing the capacity. The other challenge is resource. If a lot of the big problems are being solved by the big companies, you can imagine it requires an enormous amount of resource. One of the biggest challenges we’re facing at present is the lack of a sufficient number of resources with the skills and capacity to develop solutions. We are reaching a point in the market where demand is higher than the offer. DP: I completely agree. Many corporates and banks are investing in solutions at present and it will be years before they demonstrate some form of ROI. However, change is happening and we are beginning to see some real initiatives – UniCredit recently completed its first Italian transaction via the blockchain and your trading platform. Could you go into more detail on the transaction and what’s next for we.rade and UniCredit? DG: We’re really trying to do real life transactions and this is just the first step really. What comes next is that the customer using the platform will see the value in it and begin to use it in their day-to-day business. Of course the announcement is made after the first transaction, but what’s more important for us is to focus on the second, third and fourth transaction. The plan with UniCredit is to have a recurring transaction so that we.trade gets used to it – not just to test technologies in a live environment, but so it becomes part of the daily activity of our customers. We’re very excited and proud of the technology. DP: You’re right – the more you can test and demonstrate live transactions, the better the product becomes, and the more refinement can be made to really ease that transaction. I’m sure there’ll be many more good news stories and cases such as this that you guys will be able to discuss at Consortia 2019. Speaking of which, it is the first event of its kind where key consortiums will be together under one roof. What are you most looking forward to about the Consortia this May? RM: I think that Consortia is definitely beneficial, especially in an industry like this, because of the benefits that the consortium brings. We have seen more and more consortiums here developing in the last few years – we were a consortium until March 2018, and now even though people still call us consortium, we’re a legal entity with the bank. We have been a successful consortium because we were able to mature enough to move from consortium to legal entity, but I think this is a big challenge for many consortia. This is always my suggestion: start as a consortium but then shift to a legal entity. Perhaps Consortia might not be the best title for the conference! For listeners of this podcast, by using the promo code TFG19 you’ll get an exclusive 10% discount at Consortia 2019 in May. 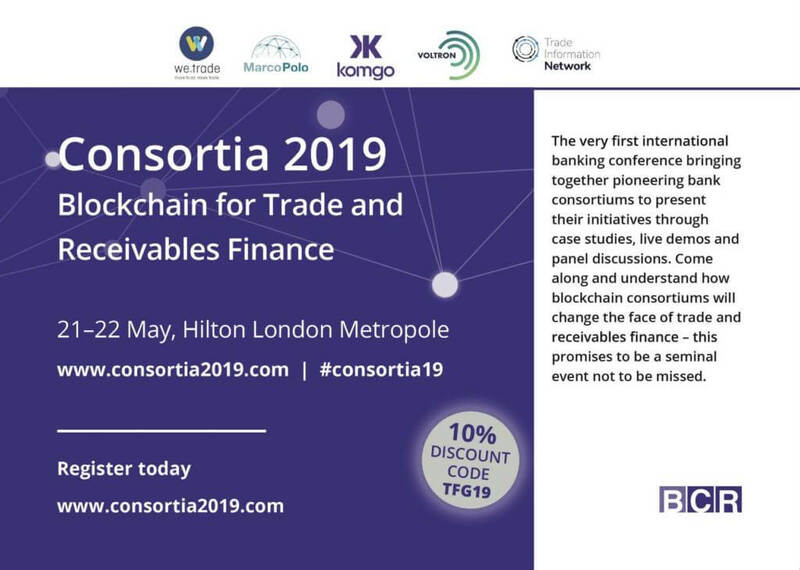 we.trade will be speaking at Consortia 2019 in London which BCR are hosting this May and we’ll hear more from Daniela and Roberta at we.trade then.